A few weeks ago, I finally got around to calling William and Lorelei’s dentist to make appointments for them. They hadn’t been there for over a year–I’d had to cancel one appointment, and then I got a little distracted by my house burning down. Making those appointments had been on the list for awhile, and I as all prepared to take care of it quickly and cross it off with at least a small sense of accomplishment. We’d had this dentist since Willie was a little over a year old and we learned he was going to need some serious dental surgery. He had what they were calling “baby bottle decay,” but which was really no such thing–he never had a bottle, and there was something wrong with his teeth from the time they started erupting. Regardless of cause, however, it meant extractions and pulpotomies and silver crowns, and we were lucky to find a dentist who would accept TennCare to do it. I fell in love with this dentist from the time he introduced himself to me by his first name. We had to travel some distance to go to his office, but we continued to do so for nearly ten years. Lorelei also has difficult teeth twice requiring outpatient surgery, and we were happy to have a dentist we trusted and were comfortable with. So when the person on the phone said sorry, they weren’t accepting TennCare anymore, and told me how much a regular visit would cost without it, I’m embarrassed to say that I STARTED TO CRY. Right on the phone. I spent the next hour consulting with the insurance, asking for recommendations on Facebook, and browsing websites till I settled on a new dentist. William has already been, and Lorelei goes this week. The office is nice, but everyone seems to expect parents to accompany the kids to the exam, which I consider unnecessary and “helicoptery.” Also, we waited well over an hour to be seen. And I always feel suspicious about dentistry in general when they tell you the kid needs a filling but it’s fine to wait until the next appointment in JUNE to get it fixed. The fact is, I haven’t been truly comfortable–except for our lost dentist–with anywhere we’ve ended up seeking dental care since I was a child myself. More on that in a minute. The big kids have seen at least six dentists that I can remember. The worst one gave them gas without asking me first and left all three of them in tears and unable to return to school. The others were unremarkable. I can’t even remember why we changed so much. Sometimes we were self-paying, and other times we had insurance and had to go where they took it. Sometimes we switched location due to a move, and sometimes it was the dentist who moved to an inconvenient locale. I never felt crazy enough about any of them to make an effort to stay with them when circumstances changed. As for John and me, we don’t go to the dentist. We don’t have insurance; I’ve never had a cavity. I think it’s been about nine years since I went. The truth is, the dentist I want–and the kind of dentistry he practiced–is gone now, and was old-fashioned even for the times. When I was a little girl (and until I went away to college) we went every six months to Dr. Clapp’s tiny, dark office just off Chapman Highway on Taliwa Court. We sat quietly in the cramped waiting room where there was perhaps one other patient waiting, looking at the collection of dentistry cartoons someone had pasted in an album. 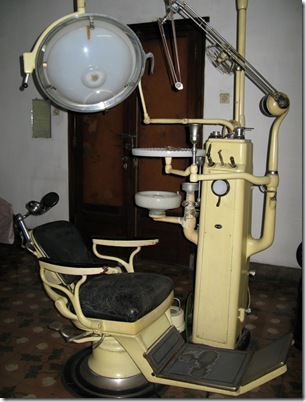 Dr. Clapp had been my mother’s dentist–still was–and he apparently hadn’t changed much since he started practicing. I never had to wait long for the receptionist/hygienist (the same one, year after year) to walk me back to one of the two exam rooms where she got me comfortable in the chair and then left. Then Dr. Clapp would come in, conduct the exam, and clean my teeth himself, while I watched my reflection in his glasses. I was so surprised to learn that dentists nowadays don’t clean teeth themselves. Every so often he had me take some water from a Dixie cup to rinse and spit. I was grown up before I saw those rinse things they have these days–I didn’t even know they worked! On the one occasion that my sister had a cavity, Dr. Clapp fixed it right then, none of this come back months from now nonsense. So even after twenty-five years I’ve never been able to get used to these waiting rooms full of people, the un-private exam rooms, the dentist who appears at the end of the exam after the cleaning is done. I’m sure there have been all sorts of advances in dentistry since Dr. Clapp closed up shop, but if there was anyone who still had an office like that, I swear that’s where I’d go.